The ingestion and query pipeline makes use of a disruptor pattern with an in-memory ring buffer to offer extremely high input rates. 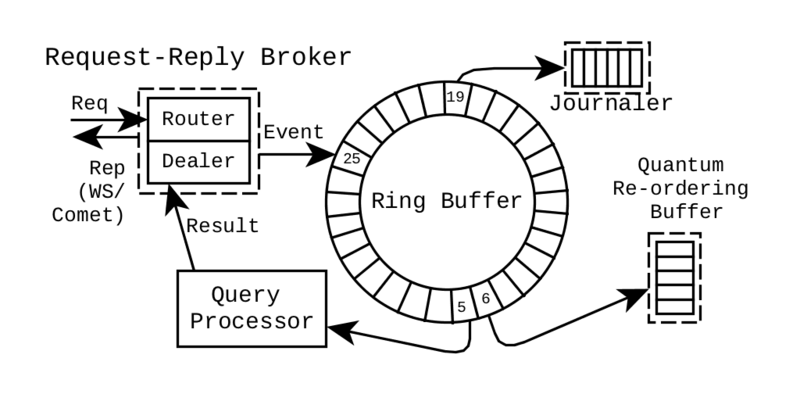 The query processor of TritanDB, as shown in the figure below, receives a query, qqq, from a ring buffer slot. A pre-compiled parser component with a specific query grammar parses the query to an abstract syntax tree (AST), a parse tree, which is passed to the next Match and Operate steps.